This color combination was selected to try to match the commonly used Landsat infrared color images (which typically uses Landsat bands 4, 3, and 1 as red, green, and blue (wavelengths not the same as AVHRR)). The match is not perfect but the images are similar. Perhaps the best way to learn what the colors in the image mean is to check what time of year the image was taken and look at a detailed road map or other atlas. Vegetation areas show as red or some variations such as orange or purple. Muddy water or shallow water shows as green. Clear water shows as black if cold or blue if warm. Urban areas often look pale blue or blue-gray. However barren regions also sometimes show a similar color. Agricultural areas show as a bright red or somewhat orange. Barren areas with some vegetation may appear somewhat purple from the mixture of red and blue. 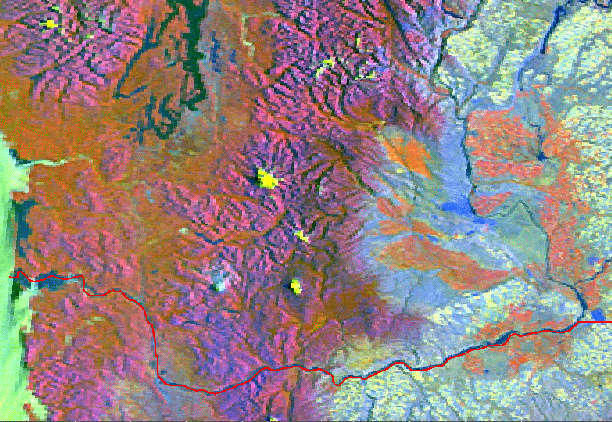 Mountainous areas such as in Colorado show altitude related color bands, from the low barren areas that appear blue, to somehwat more vegetated darker areas, to a brighter red where more vegetation occurs to a darker red typical of pine trees, to a dark yellow-gray of areas above the timberline (and perhaps some brighter yellow areas of snow). Although clear views are the most sought after it is not always possible to avoid some clouds or variations in atmospheric clarity. Clouds appear fairly white if warm and yellow if cold. This usually gives a good indication of the relative cloud heights, low clouds are warm and high clouds cold (and yellow). An unfortunate side effect of this color combination is that cold snow appears yellow. High thin cirrus cloud areas may appear as areas that are a bit more yellow than nearby areas, perhaps even faint shadows may be seen. This makes interpretation of any single image harder. Also the time of day makes a difference in the appearance of an image. NOAA-14 daytime views usually have a high sun angle, especially in summer, so relief is not well seen. NOAA-12 images sometimes show very nice shadowing making mountainous areas very apparent. Unfortunately NOAA-12 passes occur in darkness in the winter, useful for water temperature and fires but not for landform images in general.